The former Naval Air Station Joint Reserve Base Willow Grove and present day Horsham Air Guard Station is shown Thursday, March 10, 2016, in Horsham, Pa.
A South Jersey landfill showed it recognized the rising public profile of toxic PFAS chemicals when it canceled a plan to take a consignment of contaminated soil from a Pennsylvania military base, observers said Wednesday. 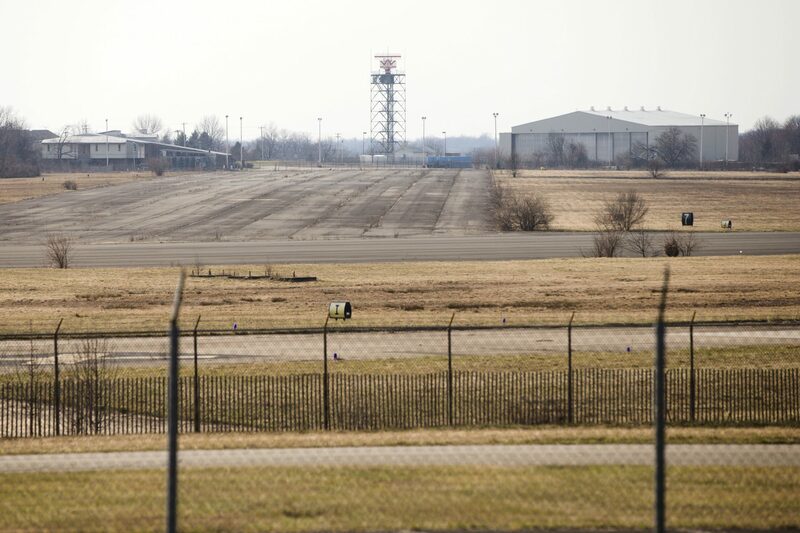 The Cumberland County Improvement Authority backtracked on its agreement to take 4,500 tons of PFAS-contaminated soil from the former Naval Air Station at Willow Grove, Pa., shortly after NJ Spotlight reported the plan on Monday. The operator of the landfill at Rosenhayn near Vineland agreed in mid-December to take the soil after determining that it met the definition of non-hazardous material, but reversed its decision before any soil was delivered. The about-face indicates that the operator was aware of growing concern by the public and by state officials that PFAS chemicals are a threat to public health through drinking water sources that might have been tainted by the soil, according to environmentalists and the head of an association of environmental commissioners. Authority president Jerry Velazquez did not respond to requests for comment on the decision, which he confirmed to several media outlets. “We certainly don’t want to be pointed to as the entity that’s creating an environmental hazard,” Velazquez told philly.com. The Navy said on Feb. 1 it is now looking for somewhere else to dump the soil which is “stockpiled and covered” at the Willow Grove base. It said it might take “several weeks” to find another location. In December, the Navy published plans to remove the most highly contaminated soil from the base, which has high PFAS levels because the chemicals were used in firefighting foam there for decades. He dismissed landfill officials’ assurances that the double-lined facility would ensure the contaminated material does not leak, saying that any liner is likely to tear eventually. Jennifer Coffey, executive director of the Association of New Jersey Environmental Commissions, said the landfill’s reversal showed a growing awareness of public opinion on the chemicals, which are linked to health problems including cancer, low birth weights and immune system problems. Some environmental groups called for tighter regulations or new laws to prevent any other New Jersey landfill agreeing to take PFAS-contaminated material, given that the soil would have complied with the operating permit issued to the Cumberland County facility. Public concern about PFAS chemicals has been stoked by recent state and federal reports showing the chemicals are present in more places and at higher concentrations in New Jersey than in many other states. The state has responded by recommending strict new health limits for several of the chemicals. Environmental officials have adopted a strict new standard for one of them, PFNA, and say they will do the same this spring for two others, PFOA and PFOS. The chemicals are not regulated by the U.S. Environmental Protection Agency, which, according to a report in Politico this week, has decided not to set standards for PFOA and PFOS, two of the most widespread PFAS chemicals. Given New Jersey’s national leadership on curbing the chemicals, O’Malley said, it would have been ironic if any amount of them had been brought into the state to be dumped in a landfill. “It’s wildly incongruent to acknowledge that these are dangerous chemicals and then allow an out-of-state entity to dump their contaminated soil in our back yard,” he said. The chemicals, once used in consumer products like nonstick cookware, are no longer made in the U.S. but persist in some places because they don’t break down in the environment, and so must be subject to strict regulation, said Tracy Carluccio of the environmental group Delaware Riverkeeper Network. “Taking waste such as PFAS contaminated soils, sewage sludge and stormwater from one place and releasing it in another is simply distributing the contamination further into communities and our environment,” she said. State Sen. Bob Smith (D-Middlesex), chairman of the Environment and Energy Committee, said the landfill authority appeared to have taken a prudent step in deciding not to take the soil. He said he hopes to hold a committee hearing on PFAS regulation in May or June. “The stories about the impact of these chemicals on human health are getting worse and worse,” he said.